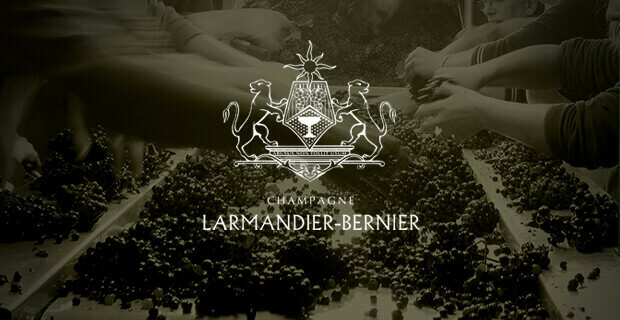 A diligent care for the vine and its needs is at the heart of every bottle of Larmandier-Bernier Champagne. 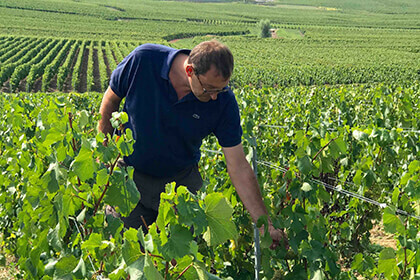 Pierre Larmandier took over his family’s business in 1988 and today cares for around 16 hectares of vines over 50 different parcels in the Côte des Blancs, together with his wife Sophie. By 1992, the Larmandiers began converting their estate to organic farming methods, followed by full-blown biodynamic viticulture in 1999. Their vines are cultivated with the greatest possible respect, allowing them to fully express the character of the family’s superb collection of terroirs. 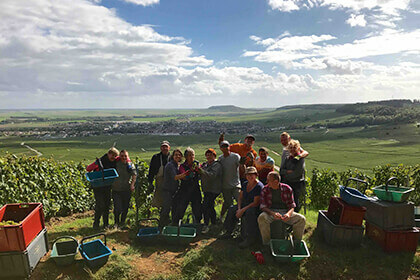 The Larmandier and Bernier families are recorded to have worked the vine in the Côte des Blancs region of Champagne ever since the French Revolution. It was first Jules Larmandier, followed by his son Philippe Allyre, who began producing Champagne here and supplying them to some of the best known restaurants of Paris. In 1971, Philippe Larmandier, son of Philippe Allyre, joined forces with his wife Elisabeth Bernier, who at that time owned vineyards in Vertus, today a Premier Cru village in the Côte des Blancs. Together they established Champagne Larmandier-Bernier, which they ran together until the death of Philippe in 1982. Elisabeth managed the estate on her own, until 1988, when her son Pierre – fresh out of business school – returned home to take over the reins of the family business. In the early 1990s, Pierre enjoyed a series of encounters with great winemakers from Burgundy and Alsace, which opened his mind to new viticultural methods. For one, he was influenced by the many benefits of ploughing the land, instead of weeding with dangerous chemicals. In 1992, Pierre decided to abandon the use of weed-killers altogether and began organic conversion of the estate. In 1999, he decided to take things one step further, adopting a biodynamic approach both in the vineyard and the winery. Instead of targeting individual diseases with specific chemical products, Larmandier aims to restore a natural balance between vine diseases and natural defences. In 2002, Larmandier purchased 4 hectares of vines in the Vertus, which had never been treated by chemicals, promising the former owner to keep things that way. Today, Pierre and his wife Sophie manage around 16 hectares of vines, spread across 50 separate parcels of the Côte des Blancs, in the Grand Cru villages of Chouilly, Cramant, Avize and Oger, as well as the Premier Cru Vertus. The property is planted with 85% Chardonnay and 15% Pinot Noir vines, around 33 years old on average. The soil is diligently ploughed in order to allow the roots to dig deeper, and the natural growing cycle of the vine is always respected. The vines share their terroir with a carpet of cover crops, thought to add nutrients back into the soil. Chemical treatments are strictly forbidden at Larmandier-Bernier. Instead, the natural competition of organisms sharing the terroir lessens the impact of diseases. The yields are kept at a moderate level, in order to allow for more structure and maturity in the fruit, which is harvested manually. At the winery, the fruit is gently pressed in a bladder press. Each cru is vinified separately, in either small or large Austrian oak barrels, depending on the character of the terroir of origin. 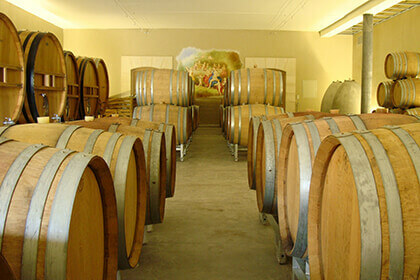 Alcoholic fermentation is carried out spontaneously with only the natural yeast present on the grapes at harvest. The wines mature on their lees through winter, followed by malolactic fermentation and light stirring of the lees if the terroir or vintage calls for it. The Larmandiers prepare the blends during the summer time (or no blending, in the case of their single-parcel cuvées) and bottle them in July, to allow the second fermentation to take place in the cool, calm and consistent conditions of their underground chalk cellar. After several years of maturing in the bottle, the wines are riddled and disgorged by hand 6 months before they are commercialised. At disgorgement, caution is taken to add only a very modest dosage, in order not to mask the expression of terroir. Unlike most Champagnes, which are dosed with around 12 grams of sugar per litre, the cuvées of Larmandier-Bernier are never over 4 grams per litre. 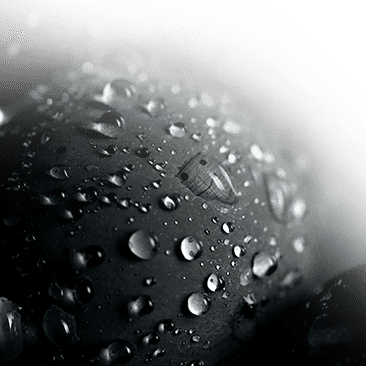 The Terre de Vertus cuvée – a single-vintage, single-terroir Blanc de Blancs - actually gets 0 grams of dosage, allowing for the greatest possible purity in the glass. A result of the Extra Brut style brought about by low dosage, the cuvées of Champagne Larmandier-Bernier stand out for their magnificent purity and signature minerality. The portfolio includes wonderful Côte des Blancs classics, including the rich, round Latitude Extra Brut NV, the Longitude 1er Cru Extra Brut, the profound and age-worthy zero-dosage Terre de Vertus 1er Cru, the Vielle Vigne de Levant Extra Brut from the Cramant Grand Cru and the Les Chemins d’Avize Extra Brut 1er Cru. Larmandier-Bernier also produces a singular rosé champagne using the saignée method, from old Pinot Noir vines planted in their Vertus vineyard. To many, the champagnes of Larmandier-Bernier represents a hope for the future: pure and balanced expressions of terroir, made possible by sustainable means of agriculture in the vineyard and great restraint practiced in the winery.